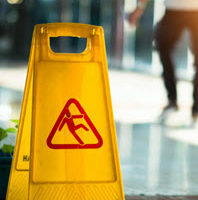 While slip, trip, and fall accidents are some of the most commonly occurring accidents on public premises, liability in these types of accidents is actually quite difficult to prove, and so they often go uncompensated. Yet, slip, trip, and falls can result in serious injuries, from broken limbs to concussions, and lead to the inability to work, extensive medical bills, and other life altering damages. If you were injured in a slip and fall accident on commercial property, do not assume that there is nothing you can do about your damages. The slip and fall attorneys at Spencer Morgan Law have experience in dealing with these types of personal injury cases and will help you gather the evidence you need to prove liability and obtain adequate compensation for your damages. Who Can Be Held Liable for Your Slip and Fall Accident? When slip, trip, and fall accidents occur on commercial property, the property owner or person renting the property can be held liable for any injuries that are sustained. In very few instances, a third party individual can be held liable, such as the head of a maintenance or construction crew. Even if you sustained injuries, however, your case may not be actionable. That is why it is so important to consult with a Miami slips, trips, and falls lawyer before taking any legal measures. Your lawyer can examine the circumstances surrounding your accident and determine whether or not it would be beneficial for you to take further legal action. When determining liability, the judge will also look at whether or not you could have possibly been responsible for your own accident, the nature of the hazard that caused the accident (could it have been preventable? ), and whether or not the property owner was aware of the condition that ultimately led to your slip, trip, or fall. For all factors that a Florida judge will consider before making a determination, consult Florida Statute 768.0755. Are You Entitled to Compensation for Your Injuries? Whether or not you are entitled to compensation for your injuries all depends. Were you invited onto the property to conduct business, were you a guest of the property, or were you a trespasser? Were there signs posted that warned you of hazards on the property, or that cautioned you to enter at your own risk? While most Florida property owners have a legal duty to keep patrons of their property safe, there are measures they could have taken to reduce or eliminate their liability entirely. However, if an accident victim can prove liability, Florida allows them to recover compensation for their losses by filing a personal injury claim. Your settlement may include compensation for medical bills, lost wages, loss of enjoyment of life, and pain and suffering, to name just a few. Should You Retain the Help of a Miami Slip and Fall Attorney? If you do decide to take legal measures, a Miami slips, trips, and falls lawyer can significantly boost your chances of walking away with a fair settlement, as they understand Florida personal injury law and what it takes to win. If you or a loved one was injured in a slip and fall accident on commercial property, reach out the legal team at Spencer Morgan Law for a free consultation at 305-423-3800.